Even though Miss Jess Shek Kin-chong has been legally blind since birth, she has always been eager to learn, ever since starting school. 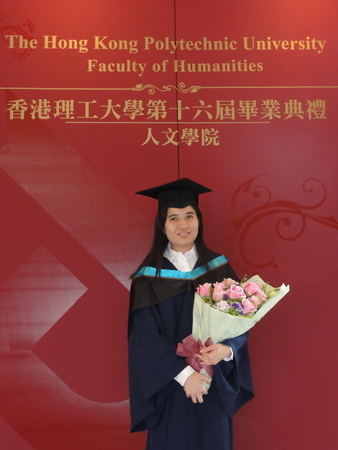 This is an especially rewarding year for Jess as she has successfully graduated from the master degree programme in Translating and Interpreting at PolyU, a goal she has been pursuing since childhood. Jess loves reading and learning languages. She always dreamed of pursuing a translation degree which would allow her to enhance her language proficiency and acquire a professional skill. Though she could not take translation as her undergraduate major, her goal grew one step closer in 2007, when she was admitted by the Department of Chinese and Bilingual Studies (CBS) for the master degree programme in Translating and Interpreting. Jess appreciated that PolyU has adequate facilities for the blind and she had a strong support group comprising fellow classmates, friends and academic staff during her postgraduate study at CBS. Their unconditional support enabled her to turn all the class and reference materials into Braille, so that she could keep up with the programme’s learning schedule. Jess’s teacher Dr Kexing Li, Associate Professor of CBS, is extremely proud of her academic achievement. He recalled that Jess always did her best and put into her studies immense efforts, which were reflected in her academic performance with two “A”s. Jess is now working at a major local bank as a senior secretary. Giving back to the community has always been her goal. Outside work, she volunteers to provide professional translation service for the Hong Kong Blind Union.